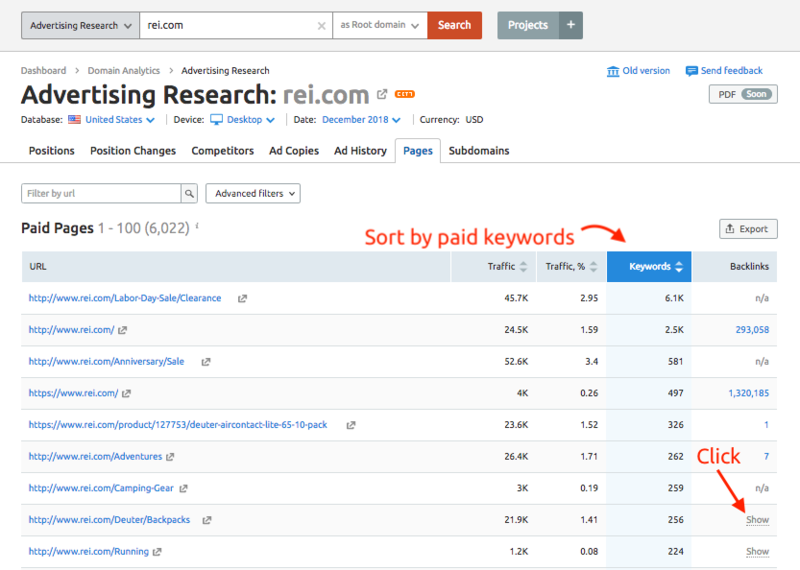 The Advertising Research Pages report shows you a list of the top landing pages that SEMrush found associated with your competitor’s PPC ads. The table sorts the pages by our traffic estimate but can also be sorted by Traffic % or number of keywords. You can reveal how many backlinks a landing page has by clicking on “Show” in the Backlinks column. This report is a great resource when you are researching the competition in your niche and looking for ways to improve your own landing pages. You can get inspiration from what your competitors are doing by opening their landing pages and observing their design and call to action strategy. To open their landing page, select the gray arrow pop-out beside the page URL. Advanced filters are available in this report to look for landing pages with specific keywords in the URL, or a range of traffic or keyword positions.